When many think of epic warriors, brave and bold, and the decisive individuals who make or break a lasting battle, often the ideas brought to bear are of muscled men and raging barbarians. No doubt, those Viking hero style warriors are nothing to be sniffed at, but a warrior and a warrior deity are two different things! Viking fighters fought as hard as they could not only to win the battle… but to win the favor of the ones who had the real power on the battlefield: the Valkyries! Soaring through the air and skilled in combat far beyond that of mere mortal men, the Valkeries were the ones who choose which warriors on the field really had the stuff to turn the tide of the greatest battle. Ragnarok is always on the cusp of happening and these chosen of Odin are the ones who handpick who will be feasting before the final battle and who will just go away! 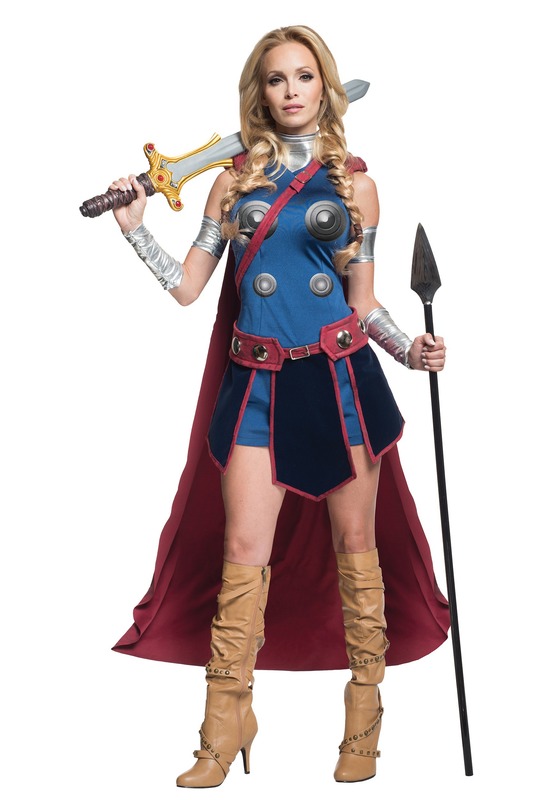 Take up your spear, mighty warrior woman, for you are sure to make the wishes of the mere mortals come true when you burst through the door in this Deluxe Valkyrie costume and decide who is worthy of the gates of Valhalla! The sleeveless dress and cape show your regal strength and the printed armor bodice reveals that you are always ready to win the next round of combat. Your gauntlets and bicep band armor give you the final feminine warrior look, unless you are ready to gear up with additional weaponry, too! Uncork the mead and get those weapons ready for battle, because we're sure this night is going to be one of legendary proportions! For Odin! To Ragnarok! Victory! The costume itself is good quality, though the bracers tend to bunch up a bit. The skirt is very short so if wearing this to, for instance, give candy to kids at an outside event, do wear leggings. They do not detract from the costume at all and may save you uncomfortable moments in the wind and cold. If you're shy about calling attention to your chest do not wear this costume, as the top two of the screen-printed phalera (or whatever those circles are supposed to be) are... strategically placed. The service and pricing was excellent, as I was in a bit of a crunch to get this costume delivered. The price was so reasonable that I could afford to order two-day shipping and still end up spending less than I had paid at a different site for the exact same thing (only to be told by that other site that they'd oversold and I would not get it in time). I was buying for a company event, and we will be moving all our costuming needs over from that other site to this one.